Are you looking for a slipcover for your lift chair recliner? Look no further. 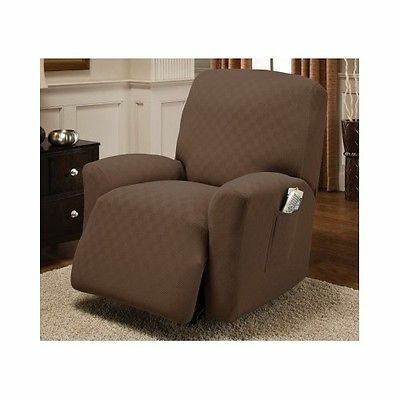 This article reviews the top 3 best selling lift chair recliner slipcovers. It looks at the power lift chair slipcover’s design, usage, and functionality. It ends with recommendations for each slip cover. Read on to find the right slipcover for you. Note: slipcovers are available in more colors than brown. Available for $79.98, this slipcover is as promised: it’ll fit most lift chairs pretty well. The fabric is made of 94% polyester and 6% spandex, giving it a really soft, stretchy feel. It is available in Cream, Garnet, Black, Chocolate, Antique, and Taupe. Below is the measuring guide for SureFit products. The Pique will fit lift chairs whose back is between 78″ and 88″ in circumference. 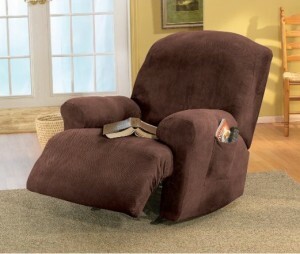 Some reviewers said that the Piquet fits their much larger recliner as well. The Pique fit a 95″ recliner just fine, so the 78″ to 88″ around the back width might be cautionary. After it arrives, wash it in cold water on delicate mode and tumble dry low. This will even out any discoloration as a result of the packaging. The service was excellent and one can view the actual slip covers at Bed Bath and Beyond before buying online. The installation is obvious and intuitive. A reviewer said that his/her daughter installed it with ease. The Picque pattern adds dimension to the upholstery, which gives it a nice texture and look. 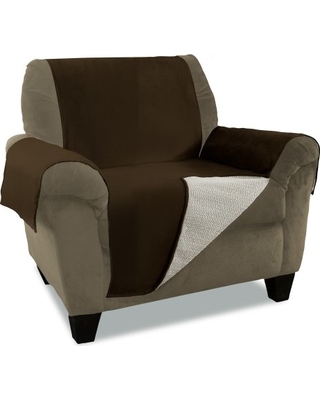 In conclusion, the Pique from SureFit is a good slipcover for any recliner. If your lift chair is within its 78″ to 88″ around the back size, get the Pique. Some individuals have found that the Pique works for larger recliners as well. Click here to read reviews, see photos, view color options, and make a purchase. Click here to read reviews. Shown here is the Furniture Fresh Anti-Slip Furniture Protector on a regular chair. While not a slipcover, the Anti-Slip Furniture Protector from Furniture Fresh does a lot of the functions of a slipcover. It is water repellent and fits on top of a recliner, giving the recliner a protective layer against spills. Do not buy this product however. It is cheaply made and not worth the $39.99 Furniture Fresh is charging for it. The first thing to notice is that the cover is not waterproof. It is “water repellent” and one must remove the cover immediately after a spill or else the liquid will seep through. Reviewers noted that the material holds on to fibers and is hard to clean. They also say that it is ugly and slips often. One even had their anti-slip strap break. Best Lift Chair recommends you avoid the Anti-Slip Furniture Protector from Furniture Fresh. Click here to read reviews. Shown above, the slipcover has a snug fit. 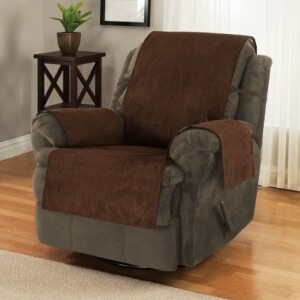 The Crossroads by Stretch Sensations is a one-size-fits-all slipcover that fits most recliners. It is made of 96% polyester and 4% spandex. It is available for $31.60 on Amazon and is the #1 selling slipcover. The material is a bit loose and holds on to dust, fibers, and hair. It comes with very poor installation instructions. The stretch slipcover will fit most recliners well. We recommend this slipcover for individuals who do not own dogs. If you do own a dog, avoid this one. We reviewed three slipcovers. These slipcovers can be used on recliners or lift chair recliners. They are the: SureFit Pique, Furniture Fresh Anti-Slip Furniture Protector, and the Stretch Sensations Crossroads. Pique – For 80% of individuals, we recommend you buy the Pique. Click here to buy the Pique. Anti-Slip Furniture Protector – We recommend you avoid this product. It is poorly made and doesn’t protect recliners very well. Click here to buy the Anti-Slip Furniture Protector. Crossroads – This is a good product for non-pet owners as it holds on to a lot of fur. It is very similar to the Pique in form. Click here to buy the Crossroads.